1. 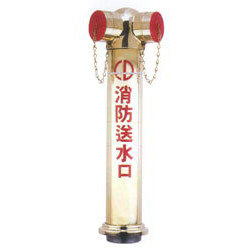 The fire department connection is designed, made tested in compliance with the standard of a Japen association of firefighting inspection, which is a global qulity. 2. The fire department connection provided 4 type to meet a magnificentoutlook on the building. 3. Two way pillar type fire departmnet connection, material inlet pipe C2700T satin brass, valve body YBsC3 i.e. C85700 satin brass. 2. Installation: 4"PT thread male inlet. 3. Connection: 2 1/2 quick connector fem inlet.